The above headline is from one of my Chemistry.com matches today. Spelling and grammar aren’t the guys strengths. Okay. I had to read more to better understand what he means by “hard”. The ENTIRE rest of his profile says …. 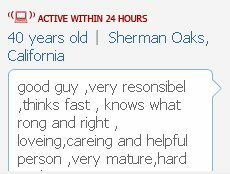 Apparently being a “hard workergood guy” means you have the ability to cut and paste but not spell check. hard workergood guy is the BEST. Workergood guys are may favorite. It is even better when they are hard. Maybe he has OCD as well and has to repeat everything a certain number of times.